abroad, welcome to Brazil and São Paulo! We hope you had fun and time to explore more of Brazil during the Carnaval celebrations these past weeks. Now that you’ve successfully become a member of InterNations in São Paulo, it’s time to start settling in - and finding like-minded people in a new city can be quite challenging. But don't worry, we're here to help! The Newcomers' Events are for you to connect with other new InterNations members in a relaxed atmosphere. With a little luck, this event will help you to overcome the first steps of moving to a new place, starting your own network and getting to know other interesting people. Also feel free to bring along your international colleagues and spouses or friends as well, but it would be helpful if you ask them to register on the site first. If you encounter any problems, don't hesitate to get in touch with us. 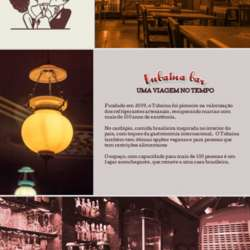 This time, we'll meet ata new venue (for us) - Tubaína bar and resto on Rua Haddock Lobo. For Brazilians it’s a nostalgic place - Tubaína was a local softdrink that many people grew up with, but the brand was almost driven out of business by big international competitors, before making a recent revival. The place therefore has a very retro and cosy feel to it. And the drinks menu pays special attention to Tubaina and other regional softdrinks from Brazil - but many beers, wines and delicious cocktails are also available. The food menu is varied (burgers and sandwiches, also great pastas, traditional Brazilian dishes, snacks and desserts, including vegetarian/vegan options). It's just a few blocks from Avenida Paulista and Rua Augusta, not far from Consolação metro, so a very central and easy to reach location.